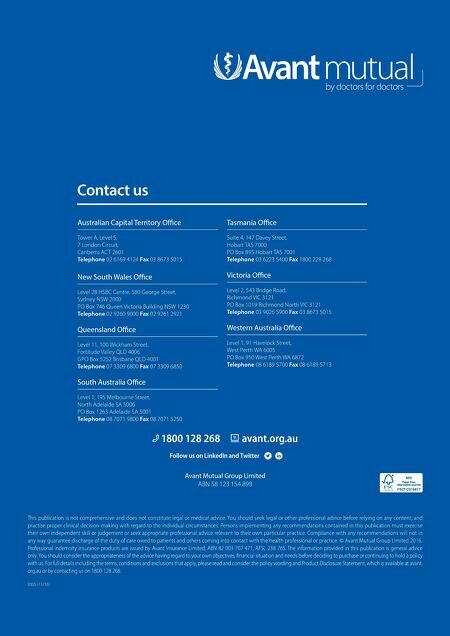 26 Avant Connect 26 Contact us Avant Mutual Group Limited ABN 58 123 154 898 1800 128 268 avant.org.au Follow us on LinkedIn and Twitter 1005 (11/16) Australian Capital Territory Office Tower A, Level 5, 7 London Circuit, Canberra ACT 2601 Telephone 02 6169 4124 Fax 03 8673 5015 New South Wales Office Level 28 HSBC Centre, 580 George Street, Sydney NSW 2000 PO Box 746 Queen Victoria Building NSW 1230 Telephone 02 9260 9000 Fax 02 9261 2921 Queensland Office Level 11, 100 Wickham Street, Fortitude Valley QLD 4006 GPO Box 5252 Brisbane QLD 4001 Telephone 07 3309 6800 Fax 07 3309 6850 South Australia Office Level 1, 195 Melbourne Street, North Adelaide SA 5006 PO Box 1263 Adelaide SA 5001 Telephone 08 7071 9800 Fax 08 7071 5250 Tasmania Office Suite 4, 147 Davey Street, Hobart TAS 7000 PO Box 895 Hobart TAS 7001 Telephone 03 6223 5400 Fax 1800 228 268 Victoria Office Level 2, 543 Bridge Road, Richmond VIC 3121 PO Box 1019 Richmond North VIC 3121 Telephone 03 9026 5900 Fax 03 8673 5015 Western Australia Office Level 1, 91 Havelock Street, West Perth WA 6005 PO Box 950 West Perth WA 6872 Telephone 08 6189 5700 Fax 08 6189 5713 This publication is not comprehensive and does not constitute legal or medical advice. You should seek legal or other professional advice before relying on any content, and practise proper clinical decision-making with regard to the individual circumstances. Persons implementing any recommendations contained in this publication must exercise their own independent skill or judgement or seek appropriate professional advice relevant to their own particular practice. Compliance with any recommendations will not in any way guarantee discharge of the duty of care owed to patients and others coming into contact with the health professional or practice. © Avant Mutual Group Limited 2016. Professional indemnity insurance products are issued by Avant Insurance Limited, ABN 82 003 707 471, AFSL 238 765. The information provided in this publication is general advice only. You should consider the appropriateness of the advice having regard to your own objectives, financial situation and needs before deciding to purchase or continuing to hold a policy with us. For full details including the terms, conditions and exclusions that apply, please read and consider the policy wording and Product Disclosure Statement, which is available at avant. org.au or by contacting us on 1800 128 268.